In Germany, it is very common for young people do a year of voluntary service after their schooling. This is a service that many sports club members can afford to give as it’s as good as free. The whole thing is organised and coordinated by the government, the municipalities and the national associations. One of these volunteer supporters is Johannes Felsner from Osnabrück. He applied for a job at a school affiliated with a Rowing Club in South Africa, the AW Barnes Primary School in East London, South Africa. Why did Johannes volunteer for rowing in Africa? “When I started high school, I discovered rowing, a sport that has already been taken up by several members of my family. So it was only a matter of time before I became a member of the rowing squad oat my school Ratsgymnasium and later also at the Osnabrück Rowing Club. My experience of rowing meant I wanted to pass on my skills to the children and young people here in East London and the surrounding area. Rowing has taught me a great deal. I believe that sport has the biggest positive impact on disadvantaged children! And rowing in Africa sounded exciting “. How was the rowing project in Africa structured? Johannes taught the children of the school alongside other project partners. “In the afternoon, it is in our sole occupation, depending on which projects we offer. As a rower it was not hard for me to decide, because there was already a rowing squad. Although last year without the participation of a German volunteer, it was continued. 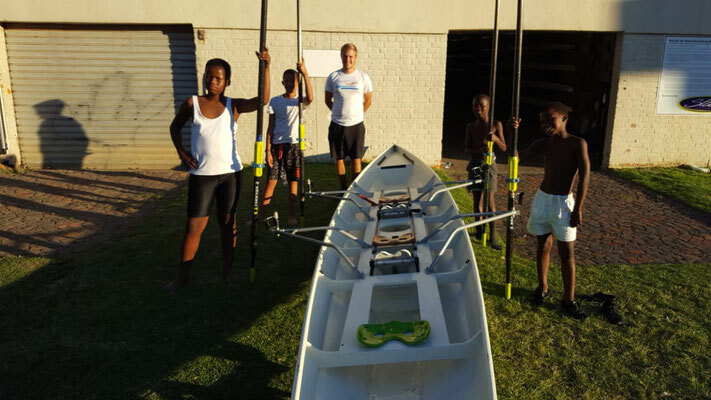 On Tuesdays, Fridays and sometimes Saturdays the rowing project took place together with Leander Rowing Club “. On those days students of the AW Barnes Primary School came to the shed after class, where I rowed and trained with them. They were driven down in the school bus and picked up after 3 hours and driven back to school. I had a boys crew and a girls crew. Since many children from the townships could not swim properly, I had to spend a few hours with these guys and girls in the Parkside pool before I could even put them in a boat. Training takes place in the beginner boats that Dave Hartwanger built for Leander RC and a double and quad already owned by the club. Do you also know someone who does voluntary service for your rowing club? What do you think of voluntary work? Would that be something you would consider for yourself or your children? Tell us in the comments.